Black and White on 21st of July joined Sticky listing with $360 reinvestment. The project offers investment plan where profit is included in payments, but it is also important to remark that investment term is very short and high risk in involved. Of course, even with the high risk, I think that it is possible to make a good profit from this project (actually many are with profit), more in the review. 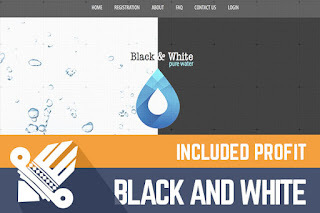 Overall Black and White does not look like typical HYIP and that sometimes can help, but sometimes it can also make things complicated because not that many people would trust a program that does not look like actual business. Of course, it is not the topmost thing to have business style design, but it can help to attract people that do not know anything about HYIP industry. One thing I like quite much on the website is effects, they make a nice look, and design appears trustable. I accepted Black and White on Sticky listing just because this project has a high daily return, so it's hard to manage such project, and I came forward to the administrator. Now the project is on the second investment cycle, and if it reaches 30-day monitoring time here on DavidNews.com, I will move it Golden Stage listing myself. Sure, there is still a lot of time for that, but that is nothing impossible if administrator will manage this project right. Overall it seems that administrator is doing things the right way. Payments are processed quite quickly, and support is prompt as well. You know for long-term projects it is alright that payments are processed slowly and support replies every other day, but for short term projects like this it is important to be active whole time and administrator of Black and White is managing that well. Like any other HYIP also Black and White will finish one day, so if you decided to make investment always calculate the risks and do not invest more than you can afford to lose. Investment plans: 10% - 15% daily for 10 up to 15 calendar days, initial investment included in the payments. Join Black and White Here!